Independent Filmmaking specializing in Horror, Thriller, and Dark Fantasy. 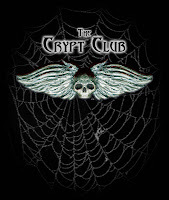 award winning film "THE CRYPT CLUB". If you're in Chicago on Saturday January 17 you'll want to check out the Horror Society's B-Movie Madness. They've done the indie film festival thing before, and they're doing it again. Bigger, badder, and bolder. Hey, it's a B-movie festival. I think a little alliteration is allowed. At least all the film titles don't start with a 'b'. That would be just too much fromage. We are back with a new Indie Film Festival. This time it’s… B-Movie Madness!! Our first festival was to shock and awe Chicago with some of the best underground, extreme horror you can imagine. Well I think we shocked a few people, but this time its a bit different. On Saturday, January 17th at the Portage Theater we will be showcasing some of the best Indie B-Movies and Horror Comedies around. Our lineup includes…. Four of the best and most original horror comedies. Each with a little special something… The feature film, It’s My Party and I’ll Die If I Want To, will feature a “Choose your own adventure” version of the film in which you the audience will be able to participate and choose how you want the movie to play. Not just the ending, but the whole movie. Its truly an original idea for a horror movie, and hell any movie for that matter. We will be having giveaways and trailers throughout the festival! Vendors and sponsors are invited to contact the Horror Society for details. Sure to be a blast and a half. What better way to spend a frosty night in the windy city? Just a fiendly reminder to enter Dead Harvey's DVD giveaway contest before the end of December. The holidays and the weather are surely foremost on your mind, but take a quick second to visit Dead Harvey and enter the contest. Then you can enjoy the holidays and ignore the weather. And, who knows, you might come away with a cool prize to kick start 2009. How swell would that be? Horror Society wants more AAAAAH!! 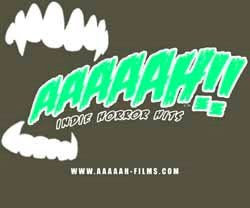 The Horror Society has just posted a review of "AAAAAH!! Indie Horror Hits, Volume 1" - and it's another severed thumb up! I tell it like it is and I will say this, Miguel Gallego of Crypt Club Productions Inc. and producer of this compilation sure picked some winners! I watched all 7 shorts, varying in running times and themes, and was extremely satisfied with every one. This compilation truly was enjoyable to watch, each film covering different themes and styles eloquently, and had me thirsting for more. I do hope that Crypt Club Productions Inc. continue this trend and put out more quality compilations and let these shorts see the light of day (or should I be saying the dark of night???) for fans of the horror genre to enjoy. Gosh! I'm blushing crimson. Well, at least it helps to keep me in the holiday color scheme of things. I'm happy they love the collection and that they're already looking forward to the next volume. Who am I to disappoint? Fortunately, we're already working on volume 2. If you haven't already sent in your short horror, thriller, or dark fantasy film... go to AAAAAH!! Indie Horror Hits for details. In the mean time, pick up a copy of this great collection of short indie horror films to make the long cold winter nights just a bit... chillier. And to all a good fright! When it rains it pours. And I'm thanking my personal deity for that. Within a week I've received links to three top-knotch reviewers praising AAAAAH!! Indie Horror Hits, Volume 1. Each of these three worthwhile sites post some heavy duty articles about horror and the fantastic. From the wilds of Utah, John Morehead at TheoFantastique gave AAAAAH!! a solid recommendation, and he touched the soft spot in my corroded heart by setting the review next to his remembrance of Forrest J Ackerman. Coming from a member of the venerable League of Tana Tea Drinkers his review carries a lot of Nile water for me. 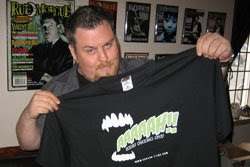 Also today, Jill Cooper from Killer-Works.com in Chicago & Toronto posted her review of AAAAAH!! Indie Horror Hits, along with a trailer and links. I appreciate that she touched on each of the collection's seven films to demonstrate the variety of horror films that we're showcasing. Dead Harvey from Vancouver weighed in last week with a review and a lengthy interview with yours cruelly. And they're running a contest giveaway with the answer found in the text of the interview. Check it out ASAP to get your entry in on time. 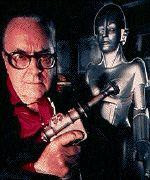 Although I'd known for a while that he wasn't well, it still came as a shock when I read on-line (thanks Joe Moe) that Forrest J Ackerman died at age 92 this past Thursday night. For those who don't know, Forry (4e, Uncle Forry, Dr. Acula) was the ultimate horror/sci-fi fanboy collector, an inspiration to thousands, and an influence upon... millions(?). He claimed to have coined the term 'sci-fi', and, as a literary agent, represented some of the genres greats, including Ray Bradbury. Probably Forry's greatest influence came as the amiable, enthusiastic, and pun-prone editor of Famous Monsters of Filmland magazine (1958-1983). That's where I got to know of him. His writing was direct and engaging. He knew that kids of all ages would be reading the magazine, and he never talked down to his readers. As noted in one of Forry's obituaries FM was the first serious but not solemn genre magazine. The punning made it charming and gave it an air of innocence - despite the illustrated monstrosities between the covers. And, oh what covers! Those Basil Gogos paintings have become icons themselves. FM #101 was my first issue, the one with Captain Marvel on the cover. We were on a summer vacation driving to Northern Ontario. I was already a rabid fan of the Universal Studios' monsters, and here was a magazine that featured them. Horror heaven. Standing at the magazine rack, looking at the Fang Mail page with a photo of a kid in monster make-up under the banner "Wanted" More Readers Like (kid's name here)" I realized that I wasn't alone in my obsession. There were more of us out there. All of us united by our fascination with monsters and horror films, and linked together through this magazine, whose beating heart was Forrest J Ackerman. Many years would pass, with FM threading its way in and out of my awareness. After Star Wars all the genre magazines focused on sci-fi much more than horror. Can't say that I blamed them, although I did resent it. 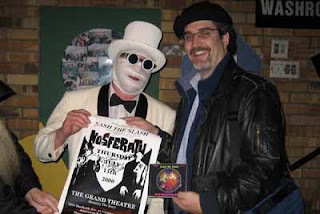 Many of Forry's fans got to meet him at a horror or science fiction convention, or at his home (the Ackermansion and, later, the Acker-mini-mansion). His house, filled with his immense collection of sci-fi & horror literature and memorabilia, was regularly open to the public for personal guided tours & Q&A sessions. I wish I had met Forry in person and experienced that fabled collection. I had several opportunities to visit him while I studied in L.A., just a few blocks from the Ackermansion, but Forry was never at home when I came calling. During several trips back to L.A. I would check in and learn that Uncle Forry was away at a convention. So, several near misses and no cigar. The best I could do was leave a note or card. I do have an autographed 8x10 photo of Forry sporting his Dracula cape and ring. He mailed it to me on request. The inscription reads, "Here's lurking at you, Miguel!" It's framed next to a photo of me standing at his Ackermansion gate beside the sign: "4SJ of KARLOFFORNIA". That's as close as we ever got. During one unsuccessful visit I left a DVD copy of The Crypt Club in a bag hanging from his front door knob. Tribute to a man who I never met, but whose contagious enthusiasm for the monsters affected the course of my life. So, on one hand, I'm sad that I never got to ask Forry about Bela, Boris, or Vincent, or that I'll never see Forry's wondrous collection of film memorabilia. On the other hand, I'm glad that he and his collection will live vividly in my imagination. Can the dream of heaven ever measure up to the reality of heaven? I thought it might be cool to post this missive in Esperanto, which Forry knew. I don't know Esperanto, so the translation would be a fair chunk of work. It could be our final private communication. But then I remembered how Forry's writing in FM made me feel part of a community, part of the joke being shared. So I'll limit my Esperanto salute to Forry by saying, "Dankon, Uncle 4e!" You'll be missed, but not forgotten. 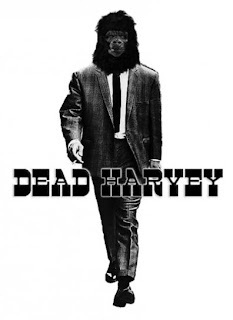 "Dead Harvey is a resource for both independent horror filmmakers and fans. We hope to keep people informed of new developments in the industry, as well as bringing attention to new and worthy independent horror films and film festivals." Not bad for a guy with severe rigor mortis. Hardly saw his lips move. The Dead Harvey site is stuffed (STUFFED, I tell you) with information, articles, interviews, resources, reviews and more. I don't know when he sleeps. Harvey must have died of exhaustion. Anyway, D.H. just posted an interview with me where we talk about stuff other than AAAAAH!! Indie Horror Hits. Sure we talk about the DVD (can't miss a chance to do that), but we also discuss the indie horror scene, indie filmmaking struggles, and more. Riveting reading to be sure. In a bold move D.H. is running his first ever contest. The answer to the skill testing question is buried in the interview. Sneaky, eh? Well, the answer can be found not that far into the interview. We're cruel, not sadistic. Simply e-mail the answer to D.H. and his decaying hand will pick a winner at the end of December. My friend, Chicago horror writer Jude Mire, just sent me a link to his short story "The Job At The End Of The Block" that is now on Horror Bound Magazine On-Line. Congratulations! It's a nifty little tale that will keep you guessing until the end just what kind of job our hero has accepted at the end of the block. Curl up and enjoy. Horror Bound Magazine is a literary magazine primarily for horror fiction, however, we also feature dark fantasy, noir, thriller and slipstream fiction. To submit your work for consideration please review our submission guidelines. We feature short stories, poetry, art, book reviews and interviews with the top talent in the field today and more! It's been a while since I heard from my UK friend Robert Pratten of Zen Films. We met at a Boston film festival and have kept in touch ever since. Okay, we're not best buddies and don't text each other hourly, but he's a cool guy and a talented filmmaker. I was impressed with his first film, "London Voodoo". "MindFlesh is about obsession. Specifically, the obsession of taxi driver Chris Jackson who believes a goddess from a parallel dimension is walking the streets of London. This obsession is destroying the natural order of the universe and Guardian extraterrestrials threaten to kill Jackson's friends if he doesn't relinquish his fantasy. Jackson, played by Peter Bramhill (Human Traffic) enlists the help of parapsychologist Frank Verdain played by Chris Fairbank (Batman, Alien3, 5th Element) to unravel the secrets of the mind and the universe. Only his Buddhist ex-girlfriend played by Lucy Liemann (Bourne Ultimatum) understands the power of the mind." Robert e-mailed to let me know that thanks to a hook up with the Twitch on-line movie site you can watch "MindFlesh" for free for three days only: December 12, 13, 14. That's a 72 hour window to tune in and trip out to "MindFlesh". Mark your calendars. Just had a lengthy phone interview with Pierce "The Punk" Derks from This Week in Geek (TWiG). We spent about an hour talking indie filmmaking, everything from finding financing through to distribution strategies. Really good questions. And I'm told my responses were none too shabby either. The interview podcast will be posted on the TWiG site in December. Watch (listen?) for it and groove on the other interviews already posted. These guys are seriously deep into gaming, films, comics - all things geek. Yes, geek is the new black. Try and keep up, eh? I'll let you know the podcast posting date & exact URL as soon as I get the word. Over and out for now. Well, we tried something new this month and sponsored awards for the Best Short Horror Film at several film festivals. The submissions rolled in and the competitions were fierce at each of the festivals. First up was Shriekfest in Los Angeles. It was another great year for this pivotal West Coast festival that is a launching pad for indie filmmakers. Congratulations to the Best Short Film award winner: "Kirksdale" directed by Ryan Spindell , and to the Best Super Short Film award winner: "Eel Girl" directed by Paul Campion. The top photo shows (l to r) "Kirksdale" lead actor Joshua Mikel, director Ryan Spidell, and festival directos Denise Gossett & Todd Beeson. At the Sharp Cuts Guelph Indie Film & Music Festival the Best Short Horror Film award went to "Ray's Big Day", a stop motion animation film commissioned to honor the legendary Ray Harryhausen, directed by Marc Lougee. 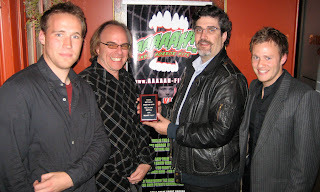 The photo shows the festival's judges Ryan James Connors (L) and Rob Keyes (R) flanking Marc & me as I present him the award at the closing gala closing. Meanwhile, at the Madison Horror Film Festival in Wisconsin, the best short horror film award went to "Initiation" directed by Stephane Beaudoin. This film also won an award for best cinematography ans the Audience Choice award. Sweet! Great turn out for this new Mid-West festival, which boasted several films from Canada, the USA, and Europe. In addition to winning a sweet prize pack of AAAAAH!! swag, the winning films will be offered a distribution deal to appear in an upcoming volume of AAAAAH!! Indie Horror Hits. Congratulations to all the winners, runners up, and filmmaker participants. The big winners were the audiences who got to see & enjoy your works. Where will we turn up next? Stay tuned - and keep supporting indie filmmaking. Horror in the Mid-West USA is alive and kicking with a brand new horror film festival in Wisconsin - the Madison Horror Film Festival, Saturday October 25th at the Orpheum Theatre Stage Door in, you guessed it, Madison, Wisconsin. It's a one-day 12 hour marathon of indie horror films & festivities, with special horror industry guests, vicious vendors, an appearance by Freakshow & the Harlots of Horror, putrid prizes & gruesome giveaways. To get you in the mood there's a pre-festival party at Inferno on Friday October 24 with a horror film costume contest. Sounds like THE hot ticket for a chilly fall weekend. Get your freak on and check it out. I wonder if anyone will go dressed as a dreadful dairy product, or changeling cheese-head? So why am I telling you all this? Well there will be some jaw-some indie horror films screened. And Crypt Club Productions Inc. is proudly sponsoring an award for the Best Short Horror Film, which includes a submission invitation to be part of an upcoming volume of AAAAAH!! Indie Horror Hits. Beast of luck to all the indie filmmakers. Give 'em Hell! 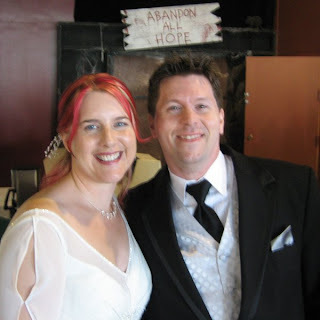 It was a match made at a horror convention and it paid off today with a wedding at a haunted attraction. 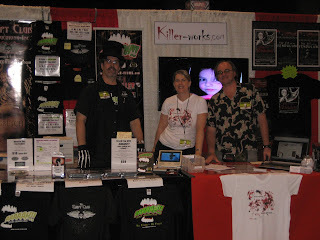 A year and a half back Killer Works' Jill Cooper & I were hanging out at the World Horror Convention in Toronto. There she met Jude Waltermire, a writer fellow from Chicago. Bim bam boom - a little over a year later the wedding invitation arrived in the mail. Wow! Who'd have thought such things could start in the midst of all that death and decay? Family and friends gathered in Chicago to witness the wedding, and partake of a fabulous wedding cake that featured the bride and groom carrying a bloody axe and a dirt encrusted shovel - partners in crime. Congratulations! Hope you get away with it... and live scarily ever after. I'll be at the 2nd annual Sharp Cuts Guelph Indie Film & Music Festival this week for the Friday Fright Night screenings. Crypt Club Productions Inc. is sponsoring the award for the best short horror film. Come on out to see the films. Winning entries may receive a distribution offer to appear on a future volume of "AAAAAH!! Indie Horror Hits". The awards & swag will be handed out at the gala on Saturday night. Details are at the Sharp Cuts web site. See you there. We're always on the look out for ways to promote indie films & filmmakers. 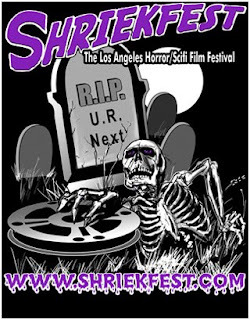 So we're really pleased to announce that we've partnered with our good friends Denise Gossett & Todd Beeson in L.A. to sponsor the award for the Best Short Horror Film at Shriekfest 2008. Get an early Halloween fix at one of the west coast's premiere horror film fests. It's a real treat for filmmakers who attend to feel really welcomed by a festival. Shriekfest 2008 starts Thursday, October 2 with a gala opening party and concludes after three jam packed days of films & screenwriting competitions with a wrap up blow out on Sunday October 5. Some screenings are already sold out, so check into it pronto while there are still seats available. Winners of the Best Short Film award will receive, in addition to the festival's award, a hefty swag bag from Crypt Club Productions Inc., and a possible distribution offer for inclusion in an upcoming volume of AAAAAH!! Indie Horror Hits. Best of luck to all the filmmakers. We look forward to seeing your craft work on screen as we cower beneath our seats. "You Can't Say That On Radio!" Well, maybe not on normal radio - but this is HMF Indie Radio coming out of Texas on the word-wired-web. I'll find out soon enough what I can & can't say on radio as I've been invited to talk live about horror stuff on HorrorMovieFans.com Indie Radio hosted by director & actor Parrish Randall. The whole rootin' tootin' no-holds-barred critical/intellectual/visceral shebang takes place Sunday September 21 at 8:05 pm (EST) for about 45 minutes. 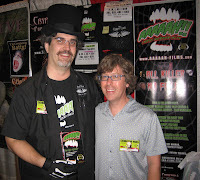 My thanks to show producer & indie horror fan Andy Rose for the invitation. I'm sure the conversation will turn [okay, it will be steered with locked arms] toward the new release of AAAAAH!! Indie Horror Hits, Volume 1. Andy was among the first to order it so he could do his homework before the air date - and to bring his family closer together [see previous blog post]. If you want to be part of the live show the Call In Number is (646) 716-7438. 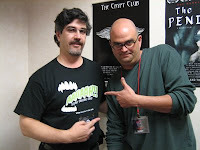 For fans of the long-running HorrorMovieFans.com Radio show this program is the second show that they've developed and it focuses solely on independent horror films. All right! The indie film movement is growing. Soon we will take over the world...! And then we'll be able to say whatever the [*&^#!] we want on the radio. Pardon mon Français. "It's Alive! It's Alive!" - And Available Now to bring your family closer together. Long time coming, but well worth the wait. "AAAAAH!! Indie Horror Hits, Volume 1" DVD is now available to buy on DVD. Click here (not on the ad photo) to buy your very own copy right now. There. That didn't hurt a bit, did it? For those of you still undecided (yes, I see you over there avoiding eye contact) here's some more information to sway your clicking finger. Since we filled the disc with the films (keeping the digital compression to the barest minimum to ensure the highest image & sound quality) we're providing a DVD@CCESS link to some SECRET WEB CONTENT. We'll be posting exclusive bonus goodies about the films and filmmakers on a Secret Page at our web site. Link directions are included in the DVD case - and it works on both PC & Mac platforms. For more info and persuasive arguments for purchasing volume 1 of this fang-tastic short horror film collection please visit our web site. Go on. I dare ya. What's the matter? You chicken? Gonna get your mommy to buy the disc for ya? Well, okay. Uh, that works just fine for me. Tell her, "Thank you." And remind her to get extra copies as Halloween gifts for the cousins. She'll thank you. And isn't your mother's love & gratitude worth everything? While you're saying "you're welcome" to your mom (I'm sure she'd appreciate a hug too), remember to tell all your friends about AAAAAH!! Indie Horror Hits - and how we're bringing families closer together. Thanks a bunch for reading this far & for supporting independent filmmaking. Did you win our Grand Prize Draw? During our Festival of Fear appearance we promised a prize package to one lucky person who visited our booth and entered our draw. Hundreds of folks filled in their ballot and said a little prayer as they handed the delicate slip of paper - representing their fondest dream of winning cool stuff to watch & wear - to our friend Jill, who gently took the paper from their hopeful fingers and mashed it into the ballot bowl with all the others. After the convention, we put these hundreds of entries into a black sack - along with some broken glass and discarded medical sharps to enhance our enjoyment of the selection process. After much blind digging and yelping, our shredded mitts pulled out the entry belonging to our grand prize winner. Fortunately for us (and the draw contestants), we used blood-proof ink in the pens for the draw ballot and we were able to read the winner's name, e-mail, and T-shirt size. Kong-gratulations to Brendan Rowe! Shortly, he'll be receiving a hefty package containing T-shirts, DVDs, and assorted swag (including the notorious K-W syringe pen) from AAAAAH!! Indie Horror Hits, The Pit and the Pendulum, and Killer-works.com. Enjoy them all in good health. Who says dreams can't come true? And now we're off to the ER and then a manicure. Giving hurts so good. Well, it was a hell of a weekend. We beat standing for hours on the concrete floors and didn't once reach for the back pills! The three days flew by thanks to the parade of fine, funky folk strutting their stuff as they stalked the aisles searching for their fetish trophy. Reception was awesome for our new DVD, still-smoking-from-the-duplicator [that would be the 'AAAAAH!! Indie Horror Hits, Volume 1' DVD for the chronically inattentive]. Seems lots of people want to know more about the great indie short horror films that slip under their radar and disappear beyond the horizon. Thanks to everyone who bought a copy as we made our convention debut. The brand new discs will be available in September through our web site & shortly from other fine retailers. You know, you don't get through one of these conventions without a helping hand from many folks. If you'll indulge me I'd like to thank some unsung folks for their kindness, good humour, encouragement, and generosity. They include my stalwart boothmates, Marc Lougee and Jill Cooper, who kept the cool banter & hot coffee flowing. There are my immediate neighbours, Alexia Anastasio (Salome) [pictured] & Kevin Sean Michaels (Vampira the Movie) who couldn't have been sweeter or funnier respectively. I hope the cheetah found a place to stay. Thanks also to the carnivorous folks from The Butcher Shop across the aisle who must have heard our growling stomachs over the din and crossed the aisle to share a box of Tim Bits on two separate occasions. Good on ya, mates! 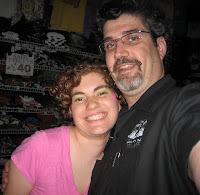 The Rue Morgue & convention staff were super cordial and helpful, especially Lisa Russell at Showtech. Louis at Merch Guy pulled our chestnuts out of the fire and delivered some wicked looking Cryptwear shirts. Thanks for the technical assist and perseverance. That's the artwork for the back of the work shirt that I'm wearing in the photos. We're debating whether to offer the shirts for sale on-line or keep them as a personal appearance exclusive for conventions and festivals. Whatcha think? Let us know via e-mail. Then there's Paula Watters at The Source Shop for busting her hump sourcing [get it?] our swag items for us. The Crypt Club key chains are on their way to becoming coveted collectors items for discerning drivers & key keepers. Thea, Adam, and Rory from the Toronto Zombie Walk offered us some brains [don't you go there] and handed out fliers for us as they ambled about sizing up people's cranial capacity. March on you crazy, hungry, undead-type people. And I'd really be in the dog house if I didn't mention my childhood friends Daryl & Derek Pullen, who dropped by to say "Hi" and stayed to anchor our load out from the bowels of the convention centre. Thanks a million. One of the weekend's more pleasant moments was a visit from Kevin Greutert, who's back in Toronto working on the mix for SAW 5. He's edited all of the SAW films and his short film, 'Old Friends' is on our new DVD. It's the film he showed the producers of the SAW films to land the directing job on SAW 6 next year. Guess he's just checking up on how the new disc is doing. I'd better not piss him off or I'll end up on the cutting room floor - literally. Friday at the Festival of Fear. First day jitters quickly pass as the crowds stream in and saunter up and down the merch-laden aisles. It's a typically slow day for vendors as many multi-day pass holders are just browsing, getting the lay of the land so they can raid their ATM's on Saturday or Sunday and swoop by on a buying run. Even so, we got a lot of interest in the new AAAAAH!! Indie Horror Hits, volume 1 DVD. Sales were made, postcards handed out, the patter was perfected as the afternoon passed. And hanging out and chatting with my boothmates (Marc Lougee & Jill Cooper) fills in the gap in the ebb and flow of the crowd. Hey, simply people watching with all the colorful costumes is a full time job here. Good first day. Saturday is the iron man event. The show runs from 10 am to 7 pm. Nine solid hours of pitching & promoting while standing on a solid concrete floor. Yay! I hear the chiropractor's convention is here next week. Maybe I can book an advance session. Well, the load in yesterday went better than expected. Being new to the whole convention thang it's interesting watching how the pros load in. It's a military operation. Stuff comes in and goes directly to it's spot. No fumphering about with decisions. Trial and error has taught them where to put thing for maximum efficiency & impact. Very cool. Seeing some friends new and old setting up. There's Thomas Gofton & his crew from the Sharp Cuts Indie Film & Music Festival in Guelph, and Scott Lefebvre working with Fearwerx just down the aisle. Should be a fun time if we get the Nerf football sailing over people's heads as they browse the merch laden aisles. If you're coming to the show head to Booth 1216 and say "Hi. Pleased to meet you. May I have my complimentary Crypt Club sticker?". To which I'll say, "Likewise. Of course." Just like civilized horror fans. then you can check out the newly arrived AAAAAH!! Indie Horror Hits, volume 1 DVDs. They still have that new car smell. We're just up the aisle from the Rue Morgue set up. See you there this Friday to Sunday at the Metro Toronto Convention Centre, South Building, Booth 1216. Stay scary. Before it hits the mean streets our new DVD "AAAAAH!! Indie Horror Hits, volume 1" will be available at our Crypt Club Productions Inc. booth (#1216) at the Rue Morgue Festival of Fear National Horror Expo, August 22-24 at the Metro Convention Centre in Terror-onto. This is the largest Horror Event in Canada. If you're not there you're nowhere. 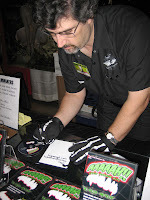 Drop, crawl, or hop by to say "hi" and pick up a DVD, some stylish Cryptwear(tm), and other goodies. And remember that all of our Lurch Merch makes a truly thoughtful Halloween gift for your boo-loved. When you scare enough to send the very best. We're sharing a big booth (did I mention it's #1216?) with our friends Marc Lougee (The Pit and the Pendulum) and Jill Cooper (www.Killer-Works.com). Talk about a trio of terror. We promise not to bite - unless there's a financial incentive. Still need more reasons to visit? Okay. The three of us are pooling a bunch of cool stuff (shirts, DVDs, posters & more...) into a basket for a REALLY BIG SWAG DRAW. And, you never know who else might be paying our booth a visit. See you there. The loooong gestation period is over. Thanks for your patience as we got our debut disc together. You can just see the head of the press release peeking out now. Crypt Club Productions Inc proudly announces the films selected for AAAAAH!! Indie Horror Hits - Volume 1. AAAAAH!! Indie Horror Hits is a new feature length collection of award winning independent short horror films coming to DVD in September 2008 – just in time for a very Happy Halloween. “ALL KILLER – NO FILLER” This is the good stuff. The short horror films that caused a buzz on the festival circuit - then vanished. If you saw them the first time you know what we mean. If you didn’t, you can enjoy them now - for the first time. From a dark, cautionary tale (THE CRYPT CLUB - with Alison Pill from PIECES OF APRIL) to gallows humor on the job (GHOST BUSTED); from the grotesque otherworld of H.P. Lovecraft (THE VEIL) to today’s outbreak fears (THE NINTH ENTRY); from the stylishly bizarre (MY SKIN! – with Tony Simmons from HUMAN NO MORE & CARNIE) and the chillingly macabre (OCULUS) to the dire family survival drama (OLD FRIENDS - from Kevin Greutert, editor of the SAW films). We’ve resurrected these great short indie horror films. Turn down the lights and dig in for your own private horror film festival. SPECIAL FEATURES: Play Options: Play All (Festival Order); Individual Film Selection - Chapter Jumps - Trailers - Greetings from creator Miguel Gallego - Subtitles: English/Spanish - DVD@CCESS link to Secret Web Content. AAAAAH!! Indie Horror Hits is produced and distributed by Crypt Club Productions Inc. Calling All Zombies! Lend a severed hand, a foot... whatever you can. The Toronto Zombie Walk has exploded from a handful of ambulatory dead into a village-sized mob. So, the 6th annual Toronto Zombie Walk needs your help! Please lend a severed hand, a foot... whatever you can to ensure the TZW stays free and fun. How can you help? Glad you asked. Support the 2008 Toronto Zombie Walk Brain Drive. "The ever-increasing size of the undead horde has forced us to apply for a permit with the city. To cover the associated permit and advertising costs, we have a limited number of 2008 Brain Drive t-shirts for sale! "The proceeds from each shirt sold goes directly to the costs of running the Zombie Walk only - we are not doing this for profit - any funds over the amount required for the permit will go towards the Zombie Walk After-Party! All prices include shipping to anywhere in Canada or the US and all applicable taxes." I've got mine. 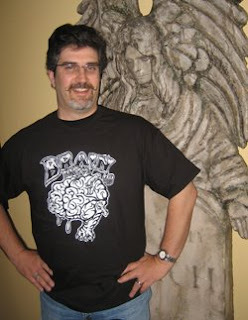 Rumour has it that wearing a Brain Drive T-shirt wards off the undead, pesky in-laws, and feelings of guilt. Remember: they make great a gift for your boo-loved. Thanks for reading. I'll see you at the Toronto Zombie Walk on Sunday, October 19th. I've been drafted for blood duty. Happy happy. Joy joy. Walk on! Well, thanks to my burger buddy Marc Lougee I was invited to do an interview with John Moorehead for his wonderful TheoFantastique site. It's a "meeting place for myth, imagination and mystery in pop culture", dontcha know. John asked little old me some pretty heady questions about personal influences, myth, folklore, fairy tales, and why I consider Walt Disney to be a master of horror. Yes, that's right. Uncle Walt is a horror meister. He could spook you as easy as Bibbity Bobbity BOO! And, of course, I managed to slip in some Crypt Club and AAAAAH!! news as well. I invite you to read the complete interview, but I warn you: pack a lunch. John said I could be as verbose as I wanted. Being Mr. Gullible Gallego, I took him at his word - and his editor quit! I'm really looking forward to getting to SLC, Utah to have a serious face to face, mano a mano chin wag with the venerable Mr. Moorehead. Check out his blog and find out why. Muy cool. 'Saw 6' Director is part of AAAAAH!! He has edited the Saw films from 1 through 4. As I write this entry he's here in Toronto cutting together Saw 5. After that, it's been announced that editor Kevin Greutert will direct Saw 6. Whoo-hoo! Congratulations! 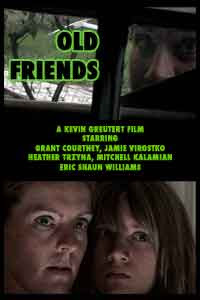 And now, I'm proud to say that Kevin has signed with Crypt Club Productions Inc. to release his short horror film, 'Old Friends', on volume one of our upcoming compilation DVD AAAAAH!! Indie Horror Hits. This is the short film that Kevin made to prove to the producers that he could wield a Saw... heh, heh, heh. So, invite some 'old friends' for an evening of dark entertainment. Coming this summer. An interview I did a couple of months ago for the on-line magazine New Voices In Horror has just been re-posted on the newly re-tooled New Voices in Fiction web site. Now, in addition to publishing new horror fiction, the freshly re-christened site accepts works of general fiction. Thanks for the scintillating virtual chat, and best of luck with the new format. Give 'em Hell, Doc! Put on your creepiest comfy shoes and get set for the Killer-Short Film Contest. This is a contest for all of us horror fans & filmmakers with an embarrassingly short attention span. Our friends at Killer-Works.com have announced an open call for entries with a no excuses submission deadline of September 2, 2008. We want to see your micro-short horror film or your trailer for a horror film (actual or invented). Films can be as short as 30 seconds, but no longer than 3 minutes. And to sweeten the cauldron, there are awards and promo opps for selected filmmakers. So screw in your thinking caps, blackmail your friends, and get filmmaking. Your micro-opus isn't going to film itself. 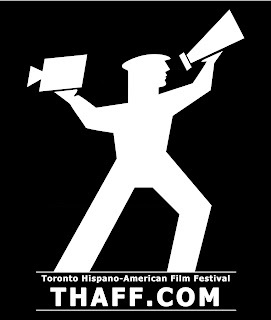 I've been working with my friends at the Toronto Hispano-American Film Festival (THAFF) helping them re-vamp the website, establish a Facebook group, and generally getting the word out about their 11th edition, which runs Thursday May 15 to Sunday May 25. Films from 11 countries, 18 premieres. Should be lots of fun. On Monday festival founder Daniel Irrazabal is scheduled to appear live on a local current events show. At the last minute he can't make it and asks me to take his place. The festival's programming director, Alejandro Pereira, picks me up and off we go to the SUN-TV studios. What a blast! Live freakin' television! Okay, it isn't Saturday Night Live, but it still had the potential for disaster. Fortunately everyone there is pretty calm and welcoming. Segment Producer Ainka Jess makes us comfortable. Johanna makes sure we have liquids and are wired us for sound. Alejandro & I go over some notes and wait for our turn on the couch. The host, Chris Van Vliet, comes out to chat and go over some of the questions and make sure he knows how to pronounce our names. And then, before we know what hit us we're on the couch doing our tag team answering routine. And then it's over. I can't wait to see a copy of our chat to remember what the heck I said. I sure hope it made sense. First, I must send a gargantuan "muchas gracias" to the staff at HF for treating us with such grace and hospitality. Kathy, Brad, Kristin, Lisa, Debbie, Carol and her daughter (frankly, I'm super embarrassed that I don't remember her moniker) you all rocked my Casbah! When I wasn't gawking at the constant parade of super heroes, storm troopers, and assorted aliens I got a chance to hang out with some pretty cool filmmakers such as the Minnesota monster magnates from Not For The Squeamish Productions, the fearsome foursome from Random Creatureface Films, the Tromatized team from Bizjack /Flemco Productions, and my travel buddy Marc Lougee, whose film - The Pit and the Pendulum - wowed the fans. Also present were scads of actors. It's pretty cool to hang out in the green room and see Star Trek's Nichelle Nichols and Nana Visitor. But the real action was on the convention floor with soon to be famous actors like December 2007 Tromette of the Month Scarlet Salem, and the multi-faceted Jed Rowen. 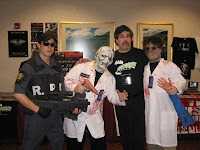 Plenty of horror film fans (in & out of costume) stopped by too, like Harry Marlow, Jarred Efird and Justin Marlow. And then there were the just plain curious folks who stumbled into the indie horror film dungeon only to spin on their heel and head back to the safety of a sci-fi costume party. A bonus treat for me was finally meeting the finely coiffed gentleman in the photo, Zachary from the Denver Hearse Association. He made time from his busy schedule planning the second annual Denver Hearse Con (May 9-11) to say hi and introduce me to some of his fellow hearse aficionados. When I get my hearse on the road I plan to point its chrome cormorant hood ornament in the direction of a future Hearse Con. All in all a packed weekend of meeting and greeting and getting the word out about the upcoming release of AAAAAH!! Indie Horror Hits on DVD. The new AAAAAH!! logo is back from Rue Morgue magazine's Ghoulish Gary Pullin - and it's both a beauty and a beast! This is our first venture into an exclusive line of 'Crypt Wear' (TM). The old school EC Comics inspired horror vibe is there along with a little extra bite. The question of what is scary and elemental came up and I think Gary nailed it with those fangs coming at you out of the dark. Merci boo-coup, Gary. So, in honour of the new logo and its comin'-at-ya approach, we're doing up a limited mini-batch of special, prototype glow-in-the-dark tee-shirts at Merch Guy that we're taking to Denver this weekend. Next weekend (April 18-20) I'll be hanging out at HorrorFest in Denver, and unveiling the new Ghouish Gary Pullin designed AAAAAH!! Indie Horror Hits logo tee-shirts! And these ain't just any old black cotton tee-shirts. They glow in the dark. "Oooooh. Scary, kids." So turn out the lights, Sadie - and let 'em rip! My friend, filmmaker Marc Lougee, is presenting and paneling at the convention and I get to tag along and do some reconnaissance work for the conventions that we'll be attending as retailers later this year. I'm looking forward to connecting with fellow horror filmmakers and horror fans to see what they think of the new AAAAAH!! logo. I also plan to connect with some of the local hearse hombres & hembras from the Denver Hearse Association. I've long admired their web site and their bravura casket coach moxy. Pity I won't be around for their Hearse Con during the second weekend in May. Just gives me another reason to return to a city I've yet to visit. Should be a whole lotta fun in the mile high city. Well, it's been a while coming together, but the snowball's rolling downhill and gaining momentum. We've got Ghoulish Gary Pullin, art director for Rue Morgue Magazine, slaving away in a secret crypt to 're-vamp' our logo for AAAAAH!! Indie Horror Hits. Going for a retro horror, EC Comics vibe. All the better to eat you with, my dear. Stay tuned as we'll announce the unveiling of the new logo here. Nash the Slash, Toronto's "serial sonic psychotron", celebrated his 60th birthday in fine style. The festivities at Stratenger's on Queen Street East featured quite amusing presents from friends & fans (the rude talking parrot was a big hit), birthday cake - and the release of a new Nash CD, 'In-A-Gadda-Da-Nash'! I was thrilled to re-encounter the One Man Bandaged and have him sign my poster from a live performance of his score to the classic silent horror film 'Nosferatu'. Now I want to know, "When is Nash's soundtrack for 'The Lost World' coming out?" Until that happy dark and stormy night I'll just have to be satisfied with the new CD and the promise of Nash's live performances this summer at The Black Swan, just up the road from me on the Danforth. Can't wait. Just got the word from Thomas Sipos at the Hollywood Investigator's Tabloid Witch Awards that The Crypt Club will be part of a special screening at the 2008 World Horror Convention. The convention takes place March 27-30 in Salt Lake City, UT. The film is part of "The Very Best of the Tabloid Witch Awards (2004-2007)". We were honoured when we won a Tabloid Witch Award last year. We're doubly honoured to be considered among their best films. And now we're triply honoured to be part of the World Horror Convention weekend. Someone please get all this honour off me. I, I... can't... breathe... gasp! If you attend, I'd love to hear reports of how the screening went. A couple of weeks ago the folks at New Voices in Horror saw my AAAAAH!! web site and asked if I'd mind doing an interview for their new on-line magazine. Well... okay. I'll do it. And I'm glad I did. Their site features horror stories by new writers, and the odd interview with us horror filmmaker types. Good folks and spooky tales for a dark and stormy night. Peacefully, and surrounded by his family, Ben Chapman - the man who embodied the Gill-Man on land in the classic 1954 film The Creature From The Black Lagoon - passed away shortly after midnight on February 21 at Tripler Medical Center in Honolulu, Hawaii. A favourite on the horror con circuit, Ben enjoyed meeting fans of all ages. His autograph and intricate written dedication on posters, photos, and books were truly special and cherished by fans and collectors. Paranormal Show article on K-W. 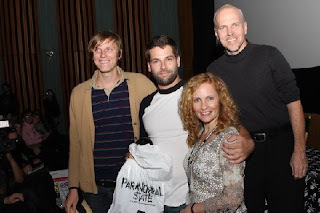 The Paranormal Show opens an extended run at Toronto's Diesel Playhouse. I attended the press preview show to report on the eerie happenings for Killer-Works. Plenty of audience participation and good spooky fun. Scary, kids. Scary! The show stars Scott McClelland as Vladimir Eisengrim and features the beguiling medium Theodora in a dramatic presentation of paranormal feats. PlayDead Cult article on K-W.
PlayDead Cult started as a funky, Toronto t-shirt design studio. Their slogan is "for the black collar worker". So it was easy to do a profile of owners Stu & Bean for my friends at Killer-Works.com. PlayDead Cult does more than t-shirts, but their hand-drawn hearse tee is my current fave. Can't wait to wear it once I get my hearse back on the road. Click & Buy Securely with PayPal.